You can't get much simpler than a two ingredient cake filling! A mixture of sweetened condensed milk and sweetened flake coconut creates a filling reminiscent of an Almond Joy candy bar's interior. 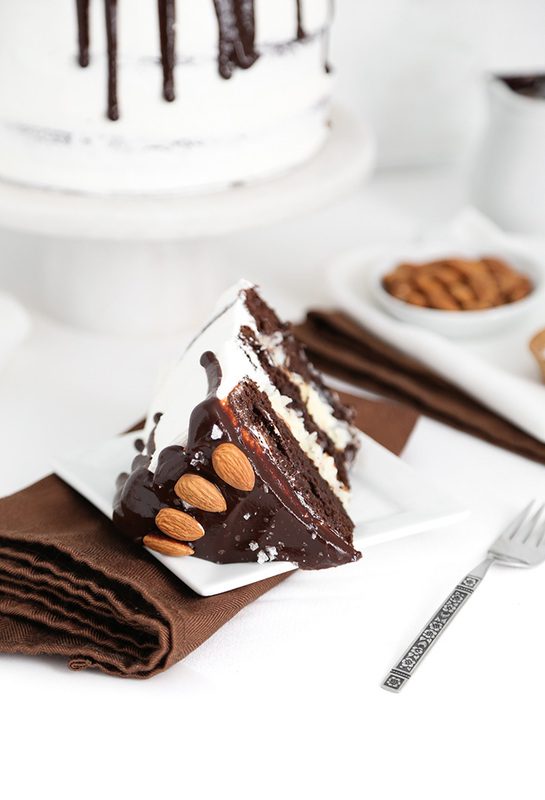 A scatter of sliced almonds over the filling will give the cake a little more almond flavor and crunchy goodness. Side note/question: Does anyone else think Almond Joy bars need a few more almonds?! The cake is covered with coconut buttercream, which I applied peek-a-boo style so you get a glimpse of the chocolate cake layers beneath. The technique is simple and can be achieved by scraping extra icing away with a cake smoother or bench scraper. Just scrape enough away to lightly expose the layers. We're not going for the 'naked cake' effect here, just a peek. There's no skimping on the almonds here! 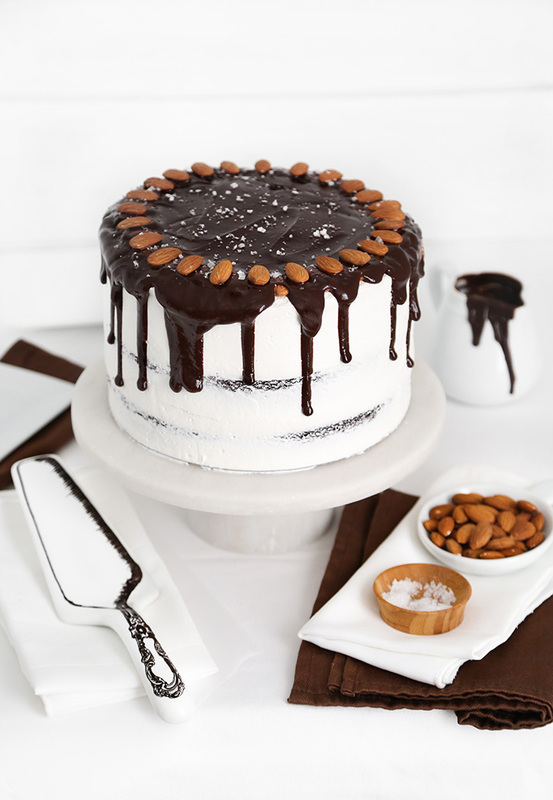 A double layer of whole crunchy almonds rests on the top edge, and the thick ganache drip is so luxurious. A sprinkling of flake sea salt makes THE TASTIEST final flourish. It's a nice counter to all the sweetness, and we all know that salt and nuts are BFFs. My favorite flake sea salt is Maldon, which you can find for purchase here. A quick word about the cake layers: the batter contains a lot of liquid so its consistency will be thin, so expect this. It can look a bit surprising or even troubling to those unfamiliar, but everything bakes up just fine. It can be baked as an 8 or 9-inch triple layer cake. My cakes are 8-inches, which yields a slightly taller cake than you'll get with 9-inch pans. Make the cake layers: Grease and flour three 8 or 9-inch cake pans (or spray with flour-based baking spray). In the bowl of an electric mixer fitted with the paddle attachment, stir together flour, sugar, cocoa, salt and baking soda. In a large mixing bowl, whisk together the vanilla extract, almond extract, vinegar, vegetable oil, and cold coffee (or water). Add the liquid ingredients to the dry ingredients, beating until well combined. Batter will be thin. Divide among the prepared pans. Bake the cakes for 35 to 40 minutes, or until a toothpick inserted into the center of one comes out clean. Remove the cakes from the oven, and cool completely before filling and frosting. Make the filling: Combine the coconut and sweetened condensed milk in a mixing bowl. Stir together with a rubber spatula until the coconut is completely coated with the condensed milk. Place a chocolate cake layer on a cake board or server. Top with half of the coconut mixture and spread to the edges of the cake. Sprinkle with half the sliced almonds (1/4 cup). Top with a second chocolate cake layers and top with remaining coconut mixture. Sprinkle with remaining sliced almonds. Place the final chocolate cake layer on top. Lightly cover with plastic wrap and refrigerate while you prepare the frosting. Make the frosting: Place the butter in the bowl of an electric mixer fitted with the whisk attachment. Beat on high speed until light and creamy. Add the sifted powdered sugar. Beat on low speed until crumbly. Add 1 tablespoon of milk and beat until incorporated. Raise the mixer speed and add milk or cream 1 tablespoon at a time until the frosting is light and fluffy, and spreads easily. Add coconut extract and beat until will incorporated. 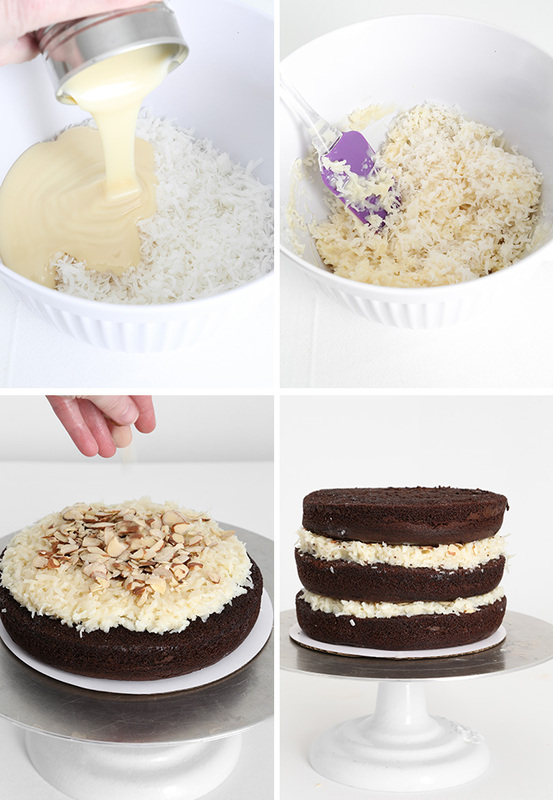 Remove cake from the refrigerator and cover evenly with the buttercream using a large offset spatula. Return the cake to the refrigerator, uncovered, to chill while ganache is prepared. Make the ganache: Place the heavy cream in a small saucepan and heat over medium until hot but not boiling. Remove from heat and stir in chocolate. Let stand 1 minute. Whisk together until lumps disappear and a shiny ganache forms. Let cool about 10 minutes in the pan. The mixture should be slightly thickened but still pourable. Transfer to a piping bag. 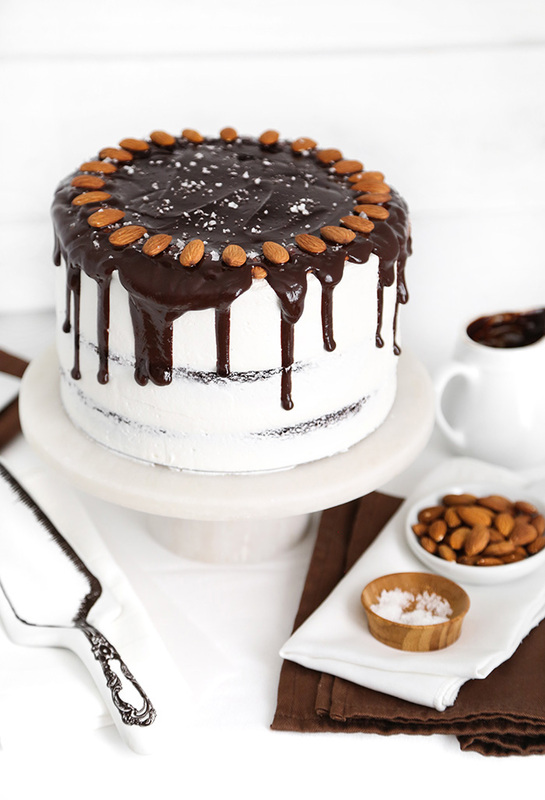 Remove cake from the refrigerator and line about 25 whole almonds around the top edge of the cake. Pipe ganache around the top edge of the cake so that it covers the almonds and the ganache drips down the sides of the cake. Use remaining ganache to entirely cover the top of the cake. 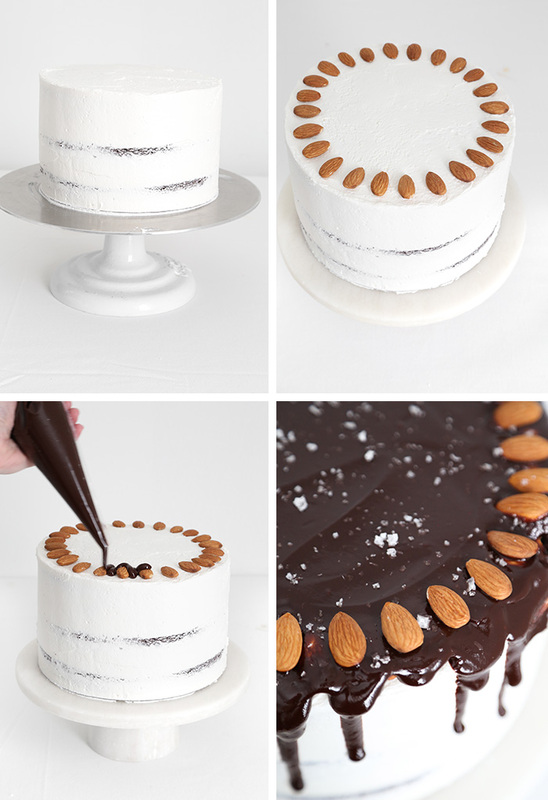 Add a second row of whole almonds around the top edge of the cake. Sprinkle cake with flake sea salt. Store the cake in the refrigerator. Bring to room temperature before serving. Note: The chocolate cake layers freeze well. Wrap them tightly and store in the freezer for up to 3 months. Thaw before using. Hi Lisa! I'm sorry you're having trouble printing the recipe. It seems to be working for us. I've created a link for you to follow instead; right click and select print. I love your cakes. This one is one of the prettiest, and one I know I can do. It looks like a few steps, but totally worth it. Yes, more almonds! I'm drooling!